Maybe it’s a Kentucky thing. One thing you often hear in Kentucky is something like this: “He ain’t from around here. He’s from somewheres else.” Seems like we’re always asking people where they’re from–Eastern Kentucky, Western Kentucky, Northern Kentucky, etc. You might even be from Louisville, which is part of Kentucky in only the most technical, geopolitical sense. Where you are from is important. Okay, it might not be as important as where you are. How you got from where you’re from to where you are is even more important. After all, that’s your life. It’s certainly more important than where you’re going since you might never actually get there. When I’m out of state, I’m from Lexington. For example, I was in Newberry Springs, California a few months ago and a guy named Shaggy asked where I was from. I said “Lexington, Kentucky” without hesitation. Truth be told, I’m not from Lexington. I only live there. Actually, I’m from Harlan, Kentucky. If you were familiar with Harlan, I’d never tell you I’m from Harlan, though. Harlan is a town, and I never lived there. I’m from Harlan County, a much broader designation. To a fellow Harlan Countian, I’m from Loyall. I might even specify Rio Vista or Park Hill. If you knew anything about Loyall, that would make sense. My father was from Evarts, also in Harlan County. My Mom was born in Detroit but grew up on Island Creek and in Cumberland. So, she was from Pike and Harlan Counties. I’ve probably met people from all 120 counties in Kentucky, which is an ungodly number of counties. By contrast, California has 58 counties. Texas, on the other hand, has 254. I’ve met very few people from either of those states. I’ve traveled through a lot of small towns in America. They all have one thing in common. Someone is from all of them. Some folks are so well-known that the town claims them. In Kentucky, we claim Abraham Lincoln who has born in Hodgenville. Nevertheless, Illinois is The Land of Lincoln. Honest Abe is one of those folks claimed by a lot of places. Will Rogers is like that. He’s all over Oklahoma. If you fly into Oklahoma City, you might land at the Will Rogers Airport. If not, you’ll land at Wiley Post Airport. Oddly enough, Rogers and Post died in the same plane crash but not in Oklahoma. Claremore, Oklahoma honors Rogers even though he wasn’t really from Claremore. He’s also not from Vinita, Oklahoma, which has a statue of him near what used to be the world’s largest McDonald’s. I read an excellent essay by Ander Monson, The Exhibit Shall Be So Marked, in which he notes the generic qualities of small towns. In my travels, I’ve noticed the same thing. Small towns are small everywhere. There are scandals and gossip, good people and bad. They all have an air of folks living easy and hard. Being there because they love it and because they can’t leave. Not all small towns are friendly. Some people are friendly and some won’t give you the time of day. It’s not all Norman Rockwell. With the exception of geography and accents, I’m not sure that you could tell the difference between Prestonsburg, Kentucky and Commerce, Oklahoma. That’s not entirely correct. 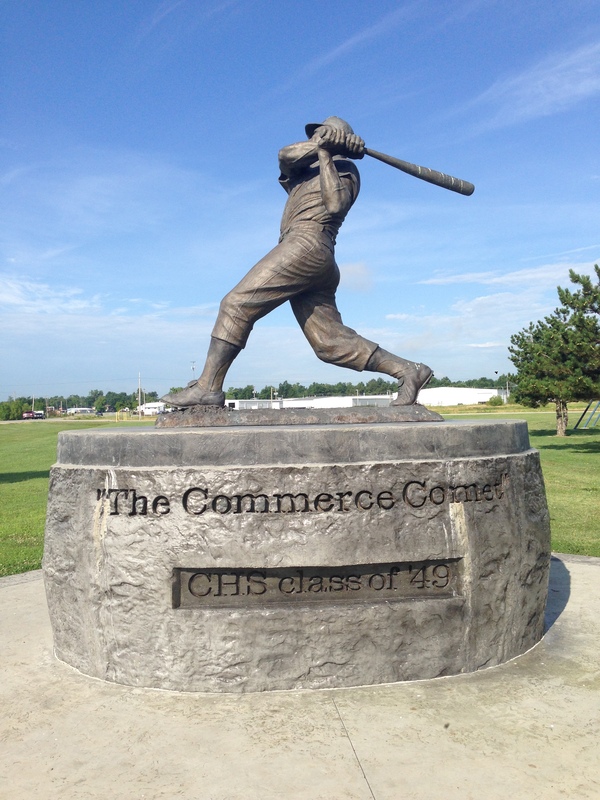 The major difference is that Mickey Mantle is from Commerce. Folks in Commerce know it, too. 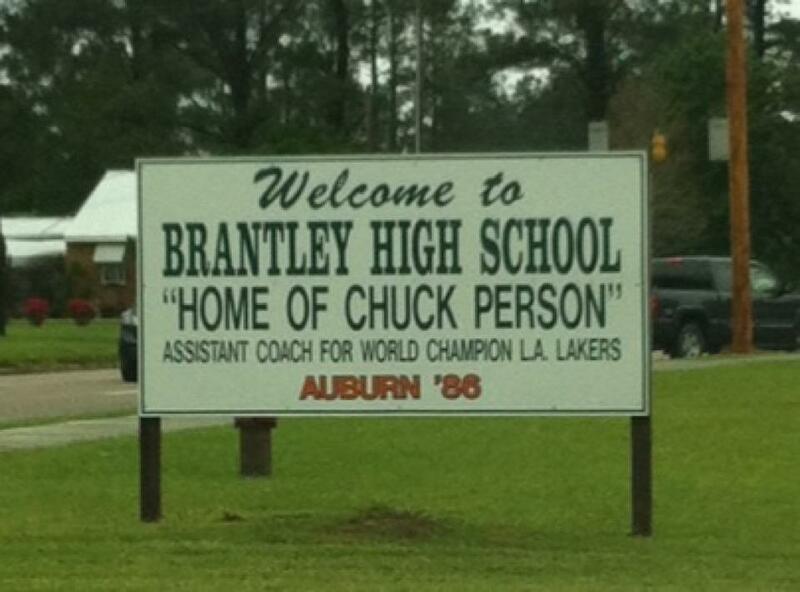 Brantley, Alabama, knows it’s the home of Chuck Person aka The Rifleman, former Auburn University basketball star and long time NBA player. Brantley is an otherwise quiet, nondescript town that has seen better days. Brantley loves Chuck Person. I’m sure they love his less famous brother Wesley, too. Brantley isn’t a lot different from Binger, Oklahoma, home of Johnny Bench. Schools, churches, stores, city hall and better times long ago. A lot of people are from Oklahoma. 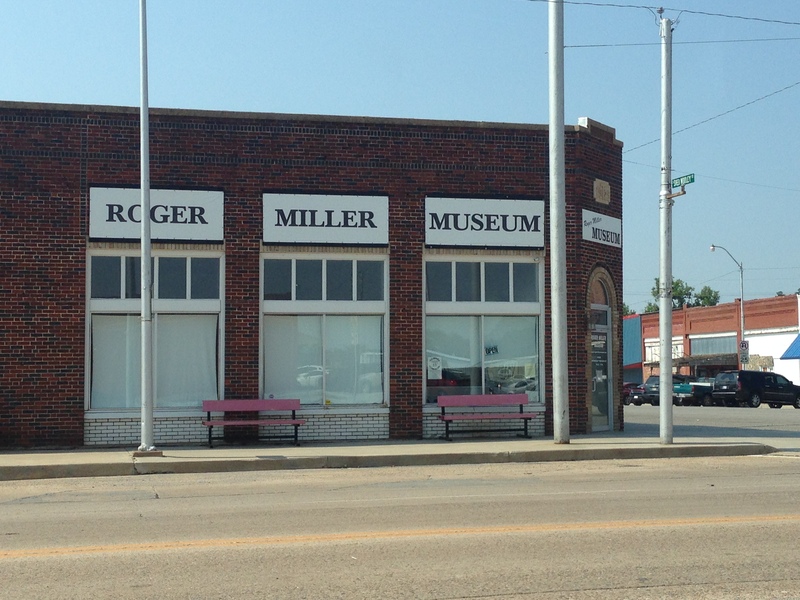 Eric, Oklahoma is the home of Roger Miller. How do I know? 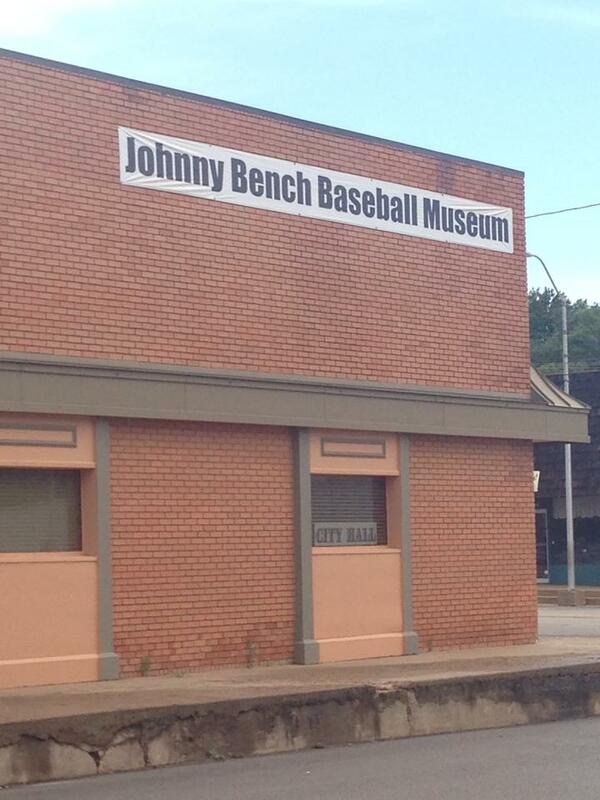 Well, they have a Roger Miller Museum, just as Binger has its Johnny Bench Museum. Twenty-five or so years ago, I was in Yukon, Oklahoma. Someone told me that Garth Brooks was from there. I had never heard of him. Of course, that changed. Now, no one has to tell you that Garth is from Yukon. They’ve painted it on their water tower. Elk City, Oklahoma is notable not for elk but for a huge oil derrick in the middle of town. It’s also the home of Jimmy Webb, who wrote the MacArthur Park and bunch of other great songs. Canonsburg, Pennsylvania doesn’t have a Perry Como Museum, but they have a Perry Como statue in a down town that could be anywhere in the country, except for the Perry Como statue. Perry doesn’t stand on Bobby Vinton Boulevard, though. That would be awkward. Your author and Perry Como. 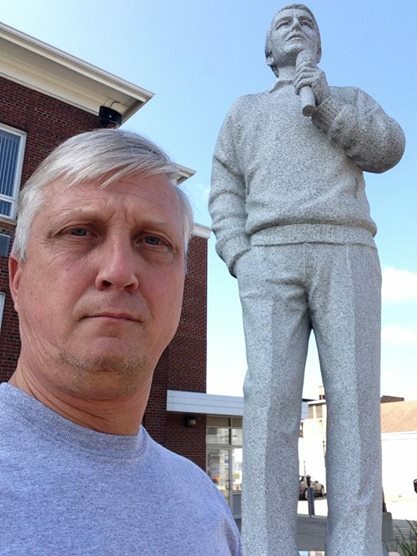 Canonsburg is close to Washington, Pennsylvania, home of Jerry Sandusky–no statue of him. I’ve been to Wailuka, Hawaii on the island of Maui. Baseball player Shane Victorino is from Wailuku, but they don’t have sign or statue or museum for him–yet. Carthage, Missouri has a beautiful courthouse. It also has both Marlin Perkins and Old West outlaw Belle Starr as natives. Edd Roush was from Oakland, City, Indiana, through which I happened to drive when I was lost once. If you don’t know Edd Roush, don’t feel bad. He was one of baseball’s great stars in the early 20th Century. That’s why they have a park named after him. I once spent a couple of days in Newark, Ohio, which is pronounced “Nerk” from some reason. I didn’t spend as much time there as Wayne Newton did. That’s where he’s from. Cuba, Missouri is the City of Murals. As far as I can tell, no one is from Cuba (which can’t be literally true), but Bette Davis and Amelia Earhart visited Cuba–at least according to the murals. I’m not sure if they were together, but that seems unlikely. Kennesaw, Georgia is a nice town. It’s best known as the town with an ordinance requiring everyone to own a gun. I didn’t have a gun when I was a there, but I was just visiting. Thankfully, I didn’t get caught. A lot of people are probably from there. And they’re packing. You can get some good barbecue in Clinton, Oklahoma. Country singer Toby Keith is from Clinton, at least that’s what a waitress told me. Why would she lie about that? She wouldn’t. I ate lunch in Needles, California on a 115 degree day. It was probably that hot when Charles Schulz lived there, but I don’t think he was born there. Then again, maybe he was. Snoopy’s brother Spike is from Needles, too. What about Loyall? We have Jerry Chesnut. Jerry is a country music songwriter of some renown. He’s in the Nashville Songwriters Hall of Fame. He even has a website. It’s no wonder we named a road after him. Other people are from Harlan County. Wallace (Wah Wah) Jones was a famed basketball star at the University of Kentucky. Legend has it that Nick Lachey was actually born in the county, but we don’t have a sign or anything for him. Kentucky claims a few people. Muhammad Ali is from Louisville. So was Hunter Thompson, but Louisville is a big city. Lots of people are from big cities. It’s a numbers game. Charles Manson is from Ashland, Kentucky. As far as I know, they haven’t built a museum or park in his honor. Maybe after he dies…. Jesse James wasn’t from Kentucky, but he robbed a bank here. So did Willie Sutton. Col. Sanders was a Kentuckian, but you probably knew that. He wasn’t a criminal. Larry Flynt is a Kentucky boy, from Magoffin County. Unrelated but just as interesting, famous White House correspondent Helen Thomas was from Winchester. We also claim Johnny Depp, George Clooney, Tom Cruise, Jennifer Lawrence and Ashley Judd, so we have are fair share of beautiful people, too. Flynt and Thomas are not two of them. You probably wouldn’t guess that any of these folks were Kentuckians (except for Flynt), but they are. Some people have a hard with identifying where they are from. Military people are a good example. They’re from all over the place. Some folks are embarrassed about their origins and will only vaguely answer with something like “Eastern Kentucky” or “back East.” If you push them, you can get the details. Of course, accents can give you away unless you are from Kansas or Nebraska or some other accent-less land. I have an Eastern Kentucky or Appalachian accent. I knew a woman from the Upper Peninsula of Michigan and found it odd that she would say “eh” of “hey” at the end of sentences. I found out that was a dead giveaway of the UP. Similarly, folks from New England speak with an odd brogue and say things like “aayuh” during casual conservation. There’s no hiding where they are from. We’re all from somewhere, even without road signs, museums and parks in our names. I guess most of us are proud of where we’re from or, at the very least, we don’t lie about it. Taking pride in it does seem a little odd given that we really have no say in the matter. Oh well… so, where are you from?